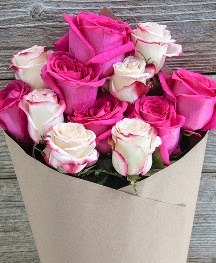 Frugal & Fabulous: Review: Roses from The Bouqs! Review: Roses from The Bouqs! I love getting flowers - I mean who doesn't? But one of the reasons why I don't send them (and I'm sure receive them) is because they can get so expensive. And half the time you don't know what you're getting. I've ordered things online, spent a small fortune, and they've looked nothing like the picture. Well guess what? That was before I heard of The Bouqs! The Bouqs is the place to buy flowers. They come straight to you within a few days of being cut. (Versus 14+ days at other places!) and have a simple pricing system. 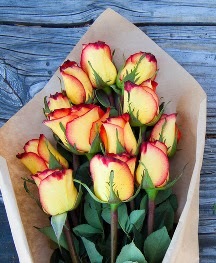 If you want a bouquet of a dozen beautiful long stemmed Volcano Collection roses (with accents) it is $40 shipped. No shipping charges! Want two dozen? It's $50 shipped! And three dozen is $70. I had the Deluxe Peace bouquet (two dozen roses) shipped to my office and I was the belle of the ball. Everyone wanted to see the roses, smell them and know who they were from. They all could not believe how nice they were and many said they must have cost a fortune. The roses came via FedEx and were packaged in two separate bouquets inside the box. I opened them up, put them in a vase and they looked gorgeous. The roses had a little bit of gel on them which must keep them fresh in transit. The roses themselves were closed pretty tight when they arrived, but after an hour or two in the water they started to open up. I've had them for about a week now and they still look (and smell) amazing! The Bouqs sell roses in all sorts of colors and varieties - I chose white because they are my personal favorite - but they also have some really fun other colors. Here are some of my other favorites: "Confetti", "Courage", "Fortified" and "Thick as Thieves!" Verdict: I love love love my roses from The Bouqs and can't stop smiling when I look at them. I kept them on my desk all week and really enjoyed being able to take a minute to stop and smell the roses during my work day. My husband is in trouble - I could get used to having these on my desk every day!!! 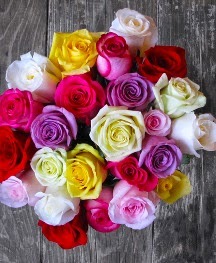 Buy it: Want to get some Bouqs for yourself or someone else? Click here and get $10 off your first order! 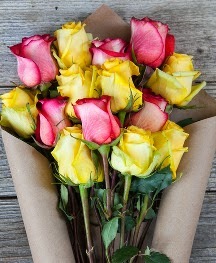 (I believe that would make a dozen roses $30 shipped or two dozen (deluxe) for $40!) You could even order two dozen, keep a dozen for yourself and bring the other dozen over to a friend! Wouldn't that make her day AND yours? !